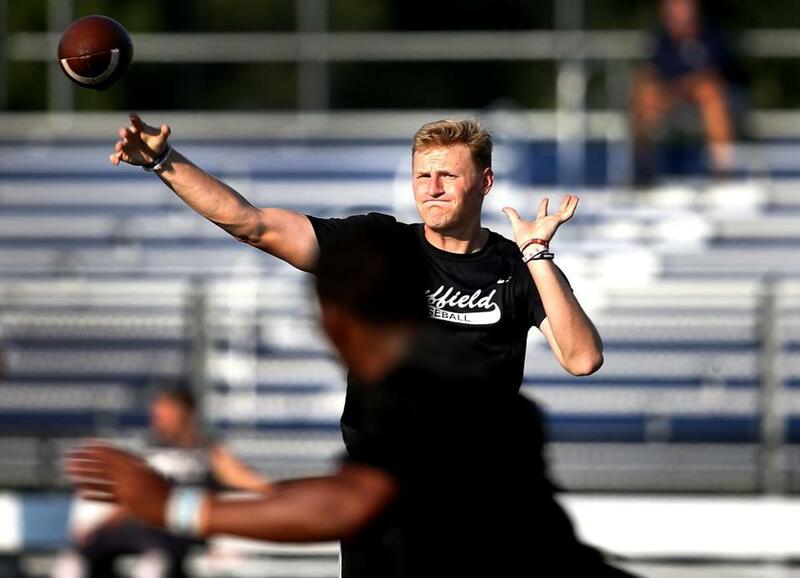 Suffield quarterback Tyler Van Dyke lets fly during the Northeast 7-on-7 championships at Xaverian. 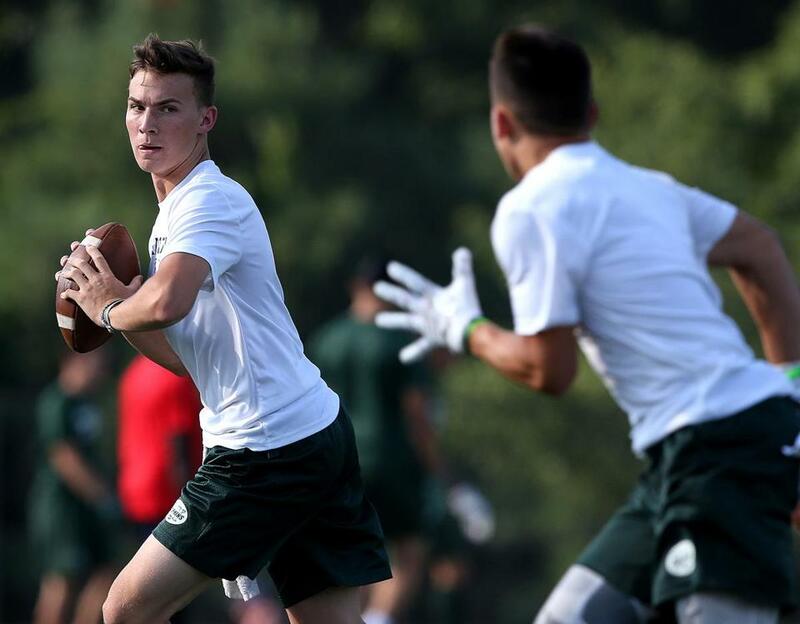 WESTWOOD — With just over two weeks until conditioning workouts kick-start the high school football season, 10 regional football powerhouses battled each other Tuesday at Xaverian in the eighth annual New England 7-on-7 championships. Suffield (Conn.) Academy took home the championship with a 14-7 win over Buckingham Browne & Nichols in the tournament final. The daylong tournament featured eight MIAA schools — Barnstable, Bishop Fenwick, Dennis-Yarmouth, Lynn Classical, Lynn English, Masconomet, Milton, and Scituate — and one each from the ISL (BB&N) and NEPSAC (Suffield). Teams qualified by coming in first or second in regional tournaments or securing wild-card bids. The 7-on-7, passing-only format gives teams the opportunity to work on offensive concepts without worrying about rushing plays or special teams. Dennis-Yarmouth, the defending champion, missed out on the semifinals by way of a three-way tiebreaker with Suffield and Lynn English after each finished pool play 3-1. In the title game, junior Tyler Van Dyke’s touchdown pass put Suffield up, 14-7, with a few minutes left. BB&N quickly drove down inside the Suffield 15-yard line.But senior defensive back Jaden Dottin stepped in front of a pass and intercepted it with just over two minutes left, sealing the championship for the Tigers. 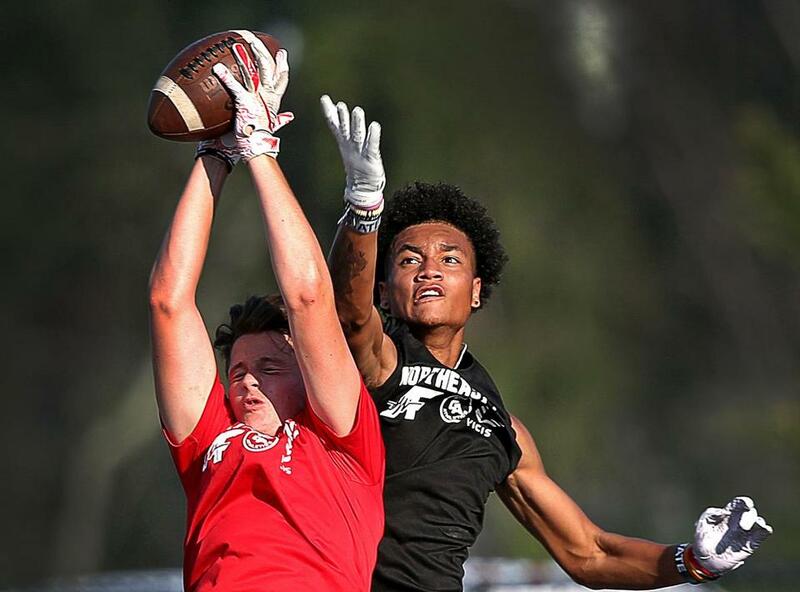 Masconomet's Nolan Ford intercepts a pass intended for Suffield’s Jaden Dottin during the Northeast 7-on-7 championships. Dottin, who said he had been reading the quarterbacks’ eyes throughout the night, was incredulous when he saw the ball about to go his way. “I’m kind of surprised he even threw it,” Dottin said. “It looked like we made eye contact, but fortunately for us, he still threw the ball and I was able to make a play on it. Dennis-Yarmouth quarterback Payton Doyle looks for a receiver during the Northeast 7-on-7 championships.